Provided photo A Troy Police Department cruiser was damaged during a high-speed pursuit on Monday evening. The subject tossed a can of paint out of his vehicle, which struck the cruiser during the 100-miles-per-hour chase on southbound I-75 around 8:30 p.m. No one was injured. The suspect eluded police officers in the Vandalia area. The case is pending. A Troy P.D. cruiser was damaged during a high-speed pursuit on Monday evening. The subject tossed a can of paint out of his vehicle which struck the cruiser during the 100 miles per hour chase on southbound I-75 around 8:30 p.m. No one was injured. The suspect eluded police officers in the Vandalia area. Case is pending. TROY — A Troy Police Department cruiser wasn’t permanently damaged during a pursuit when the suspect tossed a can of white house paint during a high-speed chase on southbound Interstate 75 Monday evening. According to Capt. Joe Long, Patrolman Mike Steffano was investigating a suspicious vehicle parked without headlights in the parking lot of Fairfield Inn around 8:20 p.m. Monday. Steffano began the pursuit when the Red Prius took off southbound on I-75. During the pursuit, which reached speeds of more than 100 miles per hour, the subject began tossing items out of the vehicle, including a can of paint. 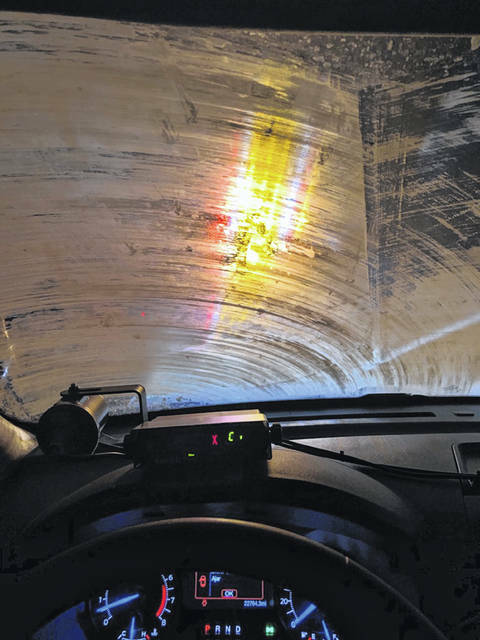 The white paint can struck the cruiser in the windshield, causing Steffano to lose visibility at the high rate of speed. No one was injured. The suspect eluded officers in the Vandalia area. The vehicle’s license plate was covered and unable to be read by officers. Other items tossed included gym clothes and a plastic baggie with an unidentified powder, which was going to be tested. Long said a body shop said the paint can be removed and no damage was sustained to the vehicle. The Troy Police Department is continuing to investigate the incident. 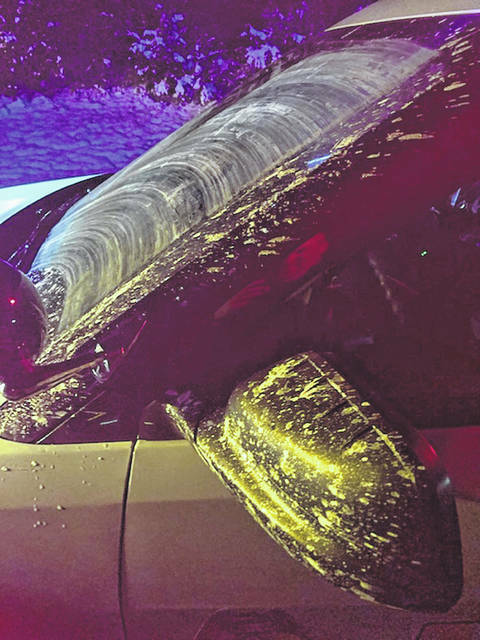 https://www.dailycall.com/wp-content/uploads/sites/30/2019/01/web1_TroyPDPaint-1.jpgProvided photo A Troy Police Department cruiser was damaged during a high-speed pursuit on Monday evening. The subject tossed a can of paint out of his vehicle, which struck the cruiser during the 100-miles-per-hour chase on southbound I-75 around 8:30 p.m. No one was injured. The suspect eluded police officers in the Vandalia area. The case is pending. https://www.dailycall.com/wp-content/uploads/sites/30/2019/01/web1_TroyPDPaintCan2-1.jpgA Troy P.D. cruiser was damaged during a high-speed pursuit on Monday evening. The subject tossed a can of paint out of his vehicle which struck the cruiser during the 100 miles per hour chase on southbound I-75 around 8:30 p.m. No one was injured. The suspect eluded police officers in the Vandalia area. Case is pending.